The author has captured the life and times of Rhys Davids very well and this book is a fitting tribute not just to one pilot of the Great War, but to a generation of young men. Their untimely passing was to have a lasting effect on their countries. DESCRIPTION: In 1914, Europe lumbered towards a war as a chain of events unfolded and nations were unable to resist as they were drawn towards a terrible conflict that was to change the World. It was the first truly industrial war. The American Civil War had demonstrated the first of a series of industrial weapons, the submarine, the ironclad warship, turret mounted naval guns, balloons, repeating small arms, and steam power, but it was The Great War that employed the refined developments on a global scale between nations of similar power and wealth. On land the machine gun forced a static war of attrition where huge numbers of soldiers were slaughtered in the hope of gaining a few yards of mud. It was a dirty war for soldiers who lived in water-filled trenches, amongst their dead and endured the days of constant bombardment that shock the ground and the very soul of a soldier. The best of a generation were destroyed and the final result was that Britain, France and Germany were left impoverished and in social upheaval with a very unsatisfactory peace that contained the seeds of the next global conflict. At sea it was equally grim with sailors facing both the terrible new weapons and the dangers of the seas. Many ships were still coal fired and dirty, while the new submarines were damp stinking tubes crammed with crew weapons and supplies, tossed about on the surface and able to submerge for only short periods when they might be shaken as badly as soldiers in a trench when destroyers dropped depth charges on them. Only the air war seemed to offer something clean and chivalrous but that was a myth than shared little with the realities of fighting biplanes. Pilots felt that they were knights jousting in the skies and there are many stories of generous acts and salutes for gallant foes. Perhaps the myth was cemented because soldiers and sailors had long endured in their respective environments, but aviators were doing something new and exciting. They were young men at the edge of a new technology and there was a glamour about their craft, making them the cover images of magazines and early films. Today it is very difficult to imagine what life then was really like. Pilots of all nations were the picture heroes of their time, lauded by society and having a familiar swagger in their new uniforms, enjoying their fame. Then there was the reality if early air war where the frail machines often collapsed without the attentions of the enemy and the unfortunate pilot had to endure what must have seemed a lifetime of horror as his machine hurtled fatally into the ground thousands of feet below. When the crash was a result of combat, the pilot was as likely to burn to death as be killed cleanly by a bullet. For those flights that resulted in a return to the home airfield, the pilot was suffering from breathing in the stream of castor oil that blasted into his face from the engine, causing many pilots to suffer diarrhoea with well-planned airfields having latrines dug close to where an aircraft would complete a landing. Flying at altitude without oxygen the pilot might black out or suffer frost bite and his guns could freeze. The successful pilots might survive for months and a few would survive the war, but many would find their combat life counted in days or even in minutes. For many, the disadvantages of combat aviation might only have become obvious after they arrived at a forward airfield. There was certainly no shortage of volunteers and the majority of British pilots came fresh from public schools such as Eton College, keen to get their combat in before the war ended. One of these young men was Arthur Rhys Davids. From Head of School at Eton in 1916, he joined the Royal Flying Corps, learned to fly was posted to a Squadron in France and by October 1917 he was dead. A brief flowering that was all too common. He came from an intellectual family and comfortable life of privilege, was well-liked by his fellow aviators and proved to be an outstanding fighter pilot. 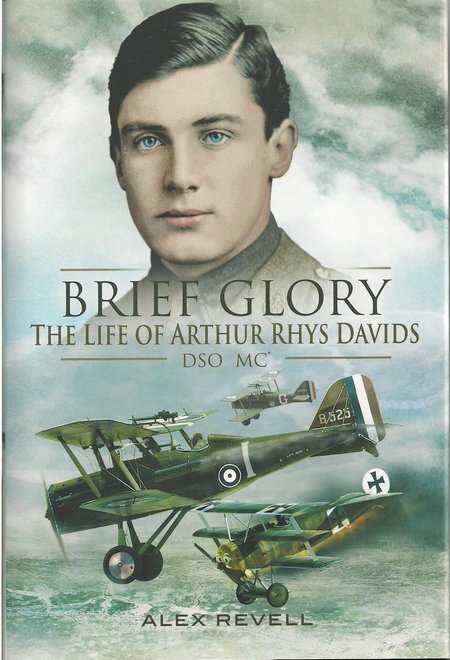 The author has captured the life and times of Rhys Davids very well and this book is a fitting tribute not just to one pilot of the Great War, but to a generation of young men. Their untimely passing was to have a lasting effect on their countries. Many would otherwise have become the leaders of their nations twenty years later when their skill was urgently needed. A plate section of black and white images adds to the text and this is a book that reads well and absorbs.